The Central Presbyterian Church is organized on January 31, 1837 at 90 Market Street. The first church was a frame building that was dedicated in the fall of 1838. The cornerstone of the second church was laid on July 29, 1851 on the east side of Washington Street, between Market and Bank Streets. The dedication was held on January 25, 1853. 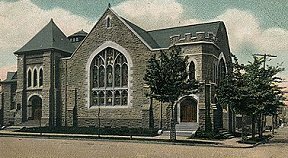 On October 18, 1892 the congregation moved, after a vote, to Clinton Hill. Temporary, services were held in a store on Clinton Avenue, near Ridgewood Avenue. The new church soon opened at Clinton and Belmont Avenues. The church is in the habit of giving material aid to its own poor who are members, and to nonmembers with whom it is brought in contact, in the course of the church work. The Board of Deacons is responsible for the visiting of the church. Men's League lectures are conducted under the auspices of the church.